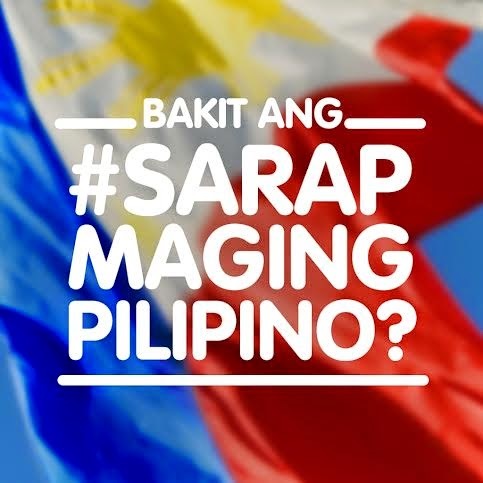 Just saw Jolibee's new ad for Independence Day called #SarapMagingPilipino, and it made me tear up a bit. You see, over at Facebook, a lot of the people I know are on trips abroad and they keep saying things like how horrible it is here in the Philippines. Look, I'm not blind to the ills of our country but if it's that bad, then don't come back, diba. Whenever I see or hear people talk about how it's so much better in other countries, my first thought is always, "Then help make life better for us here. "A lot of us always just talk about how everything is so bad here (and always over cups of designer coffee or something like that!). But it's the same all over the world. There are good things, there are bad things. Nothing is ever perfect. When I go abroad, I think, "Oh wow, the public transportation system is so efficient. But, wow, the train is almost P80 a trip? So expensive! ""Oh wow, the people here are so disciplined but, wow, they're so frikkin' rude, too!" "Oh wow, the streets are just as filthy as Manila's streets but at least here, it's cold so it doesn't stink." "Oh wow, no traffic at all but there's a rule you have to replace your car every 3 years? Kaya naman pala walang kotse nyek." I'm not saying the systems of other countries are bad. I also believe that the ticket prices of the MRT should be raised way up, just like in other countries, so that the MRT can make money to buy more trains and therefore accommodate more passengers. That's called running a business. But that's also called anti-poor. A lot of what makes other cities in the world so nice and clean is because of their anti-poor policies. Parking in London for a month? USD 950 (almost P41,000 or P1,300 a day) vs around P120 here. To drive around London in your own car? You have to pay GBP 10 (P730) just to enter the city. Kung ganyan din dito sa Maynila, imagine spending P3,650 a week para lang pumasok sa office! We need to make changes if we want a better life. But we're not willing to commit to those changes. For one thing, we're so poor. We can't make changes that will make life even more difficult for the masses. Or even if we wanted to, like giving people access to contraceptives, some institution warns us that we will be sent to eternal fire. Or we can make changes actually, but only if ALL our tax money was used to improve our lives. As for me, I like it here. Even with all the bad things like our singing, corrupt politicians, I really, really do like it here. When I was very poor, I liked life here. It was hard, yes, but my education was free, I had a big family who helped take care of me, food was cheap and delicious, and everyone's really warm and funny. Now that my life is better, I still think it's nice here. It's not just because I can afford more things now. There's still the big family, the wonderful friends. And things are still cheap here compared to life in other countries. That's what I'm so grateful for when I travel. My eyes are opened to how nice things are somewhere else, but I also see that life in my country is not bad at all. The people are amazing, the food is the best. In my humble opinion, that's all that matters in life. I totally agree. Mahilig mag reklamo ang pinoy pero hindi mahilig gumawa ng solusyon. so true. sometimes we just have to make things better here especially when we witness what's best outside. we should always think about what we can do right in our own soil. hindi yung puro keme na suko na 'ko sa pinas, walang magbabago.